For the PaperWorks Co. Blog Hop please click HERE! Hello! 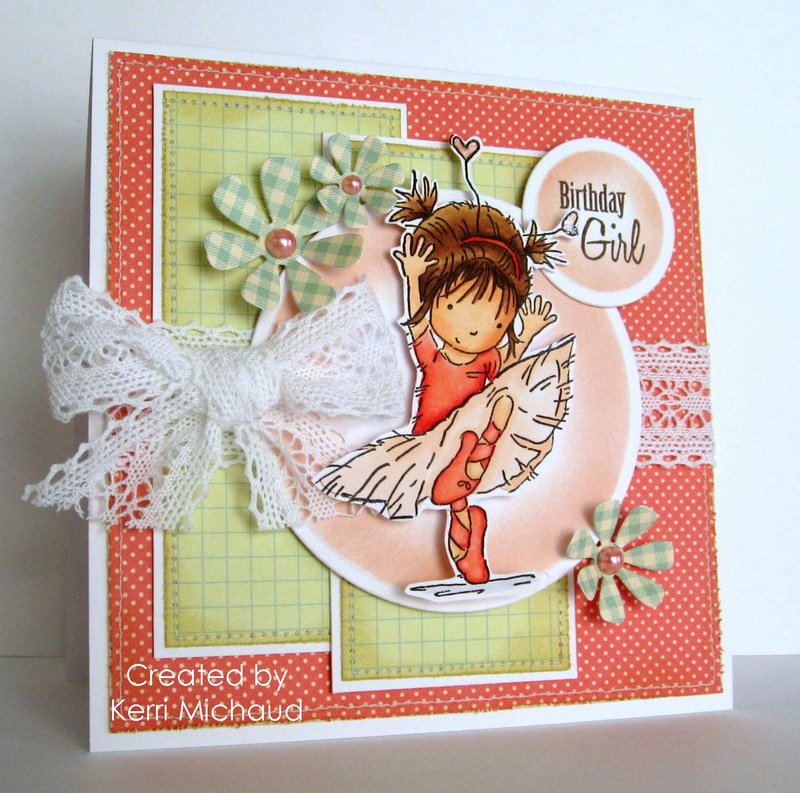 This is the card that I have on the Really Reasonable Ribbon Blog today. I finally had a chance to ink up this ADORABLE image from Lili of the Valley called Little Ballerina~LOVE! I decided to play along with the current LOTV Challenge which is a fab sketch by Bev. I used some October Afternoon Fly A Kite dp along with some GORGEOUS Abigail White Crochet Lace from Really Reasonable Ribbon. This lace is so soft and ties the prettiest bows! The sentiment comes from the PTI set Butterfly Dreams. We are heading to the soccer fields this morning for my daughter's game, and then my hubby will be glued to the t.v. watching March Madness. I don't mind because it will give me time to get crafty, and I also really like college basketball~Go Pitt Panthers!!! Gack! This is so cute! I love this card Kerri! Gorgeous! Such a sweet image! CUTE CUTE CUTE!!!! I love these colors together and the image is adorable. What a wonderful card Kerri, super sweet, great colours. Wow! and the lace bow is perfect for this little ballerina! Kerri girl this is SOOOOOOO SWEET!! Oh my goodness I love how you tied your lace, I haven't tried that yet, thanks for the inspiration!!!! ADORABLE card and LOVE these papers too!!! Just BEAUTIFUL girly! ACK... This is totally ADORABLE. Oh she is so sweet. Beautifully done. Holy sweetness! LOTV images are just darling and you have done a b-e-a-uuutiful job with this!